Awesome News! The Newest JETBeam WL20 Hunting Flashlight will bring great surprise next week, News-JETBeam Electronic Technology Co.Ltd. 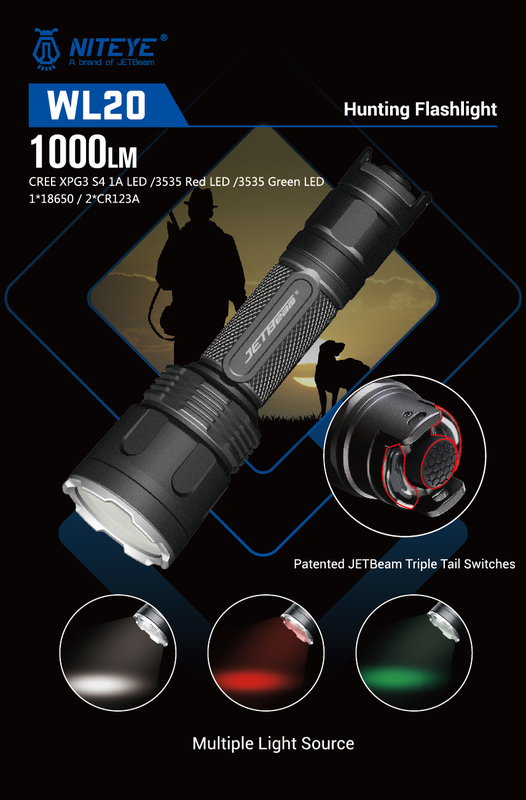 The JETBeam 1000LM WL20 Hunting Flashlight is specially designed for night hunting and searching. It uses a CREE XPG3 S4 1A LED to emit a wide range of light up to 254 meters for hunting and searching. Patented JETBeam Triple Tail Switches technology allowing for momentary-on, strobe and easy access to all outputs by one hand operation.To cope with unexpected situations in hunting, the considerate White, red, Green Multiple Light Source of WL20 is designed. WL20 Hunting Flashlight is compatible with 1*18650 or 2*CR123, which have higher energy intensity, better power storage and longer runtime compared to common AA batteries. Overall, it is a great choice for hunters, law enforcement personnel.